DataObjects.Net Team Blog: DataObjects.Net Contribution Program Rocks! Today I'm proudly presenting one more participant of the program — Mr. Alexander Ovchinnikov! 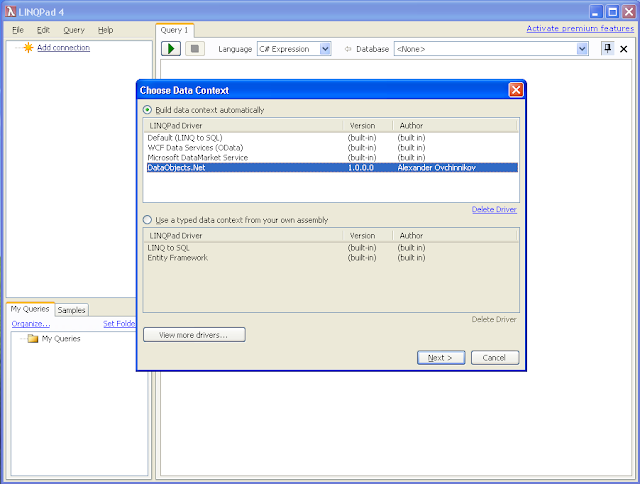 Alexander is the one who created DataObjects.Net Driver for LINQPad tool. Loud ovation! First of all, download LINQPad and install it. Secondly, download the driver. 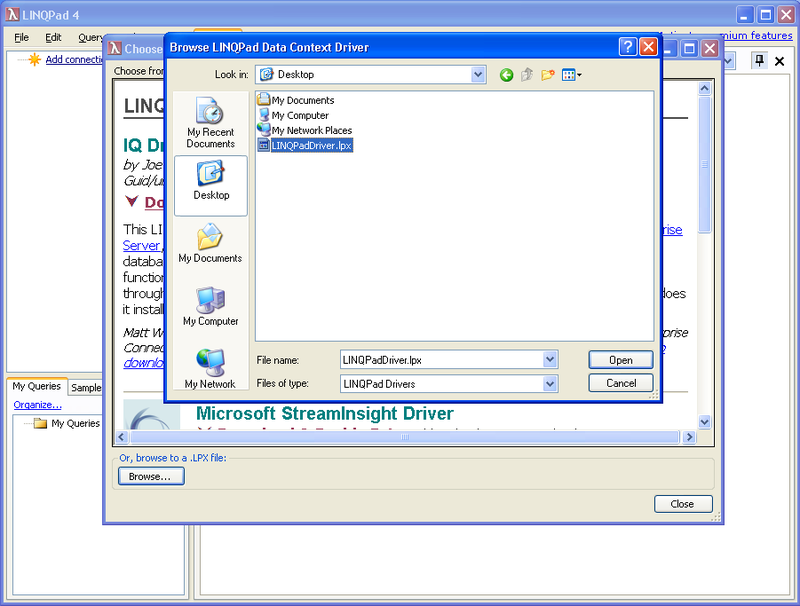 It is named "LINQPadDriver.lpx" and is located in Bin\Latest directory of "Binaries for .NET 4.0" package, build 7475 or later. Next, launch LINQPad application. Click "Add connection" link. In the opened window click "View more drivers..." button. 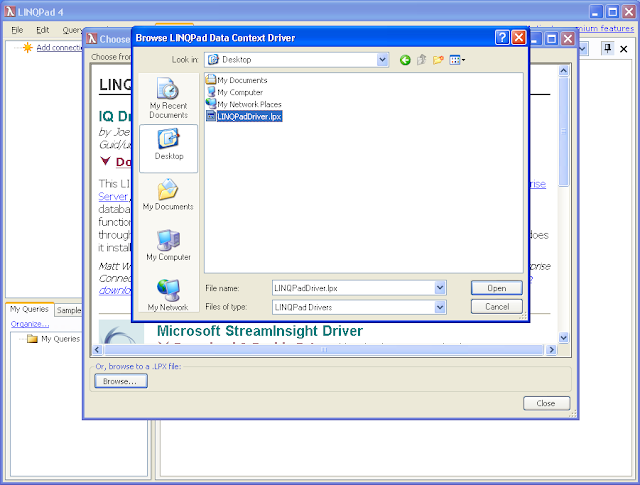 In the next window click "Browse..."
Locate LINQPadDriver.lpx and open it. 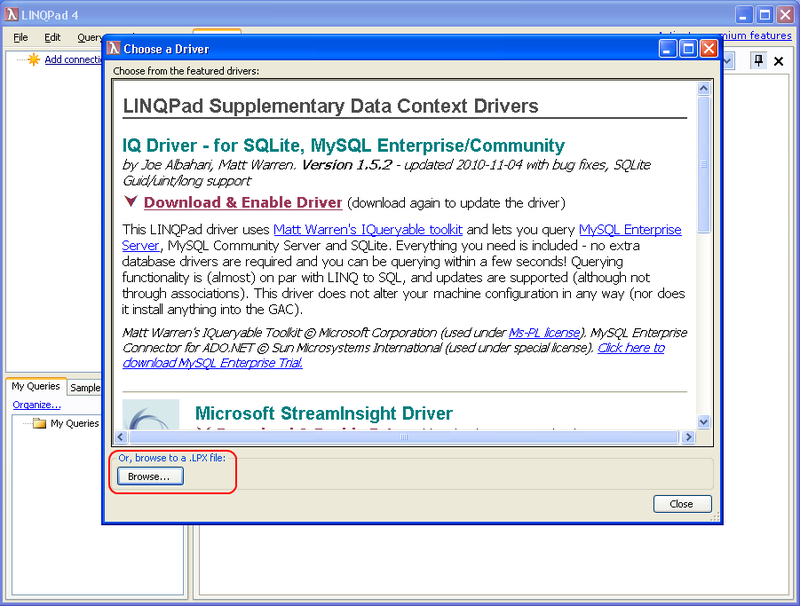 After that LINQPad will show a message box that the driver is loaded. 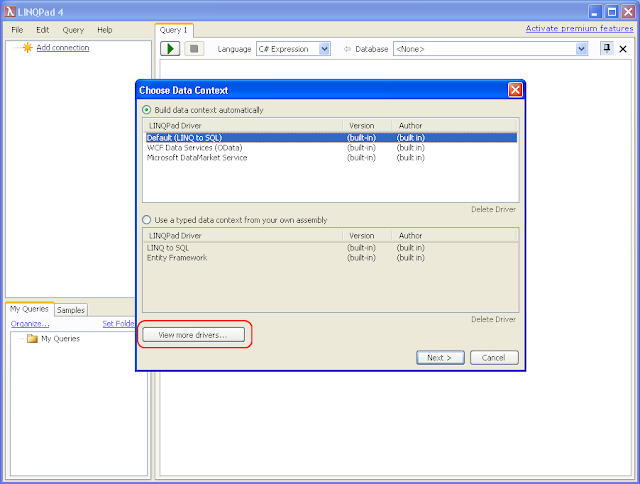 Select "DataObjects.Net" from the list of available drivers and hit "Next"
Connection configuration window will be shown. Here you should set connection name, domain connection url and add all required assemblies with persistent types to the list. I added the one from the upcoming security sample which in turn is based on Northwind model. 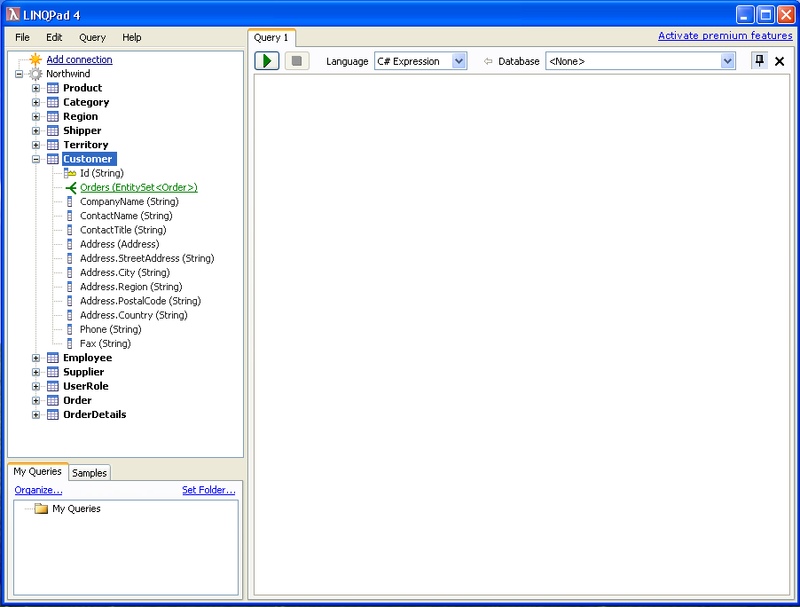 After several endless seconds, the domain is built and the domain model is populated to the left pane. That's it. 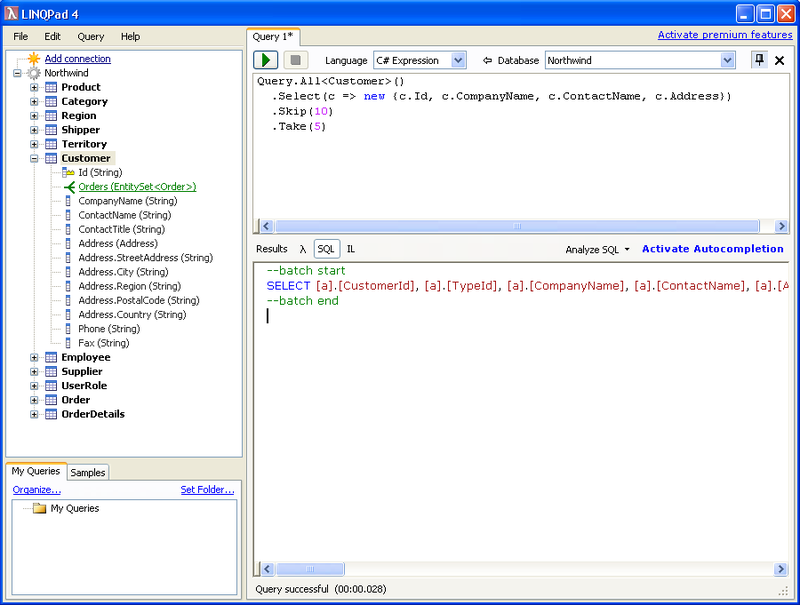 Now you can write LINQ queries and execute them. 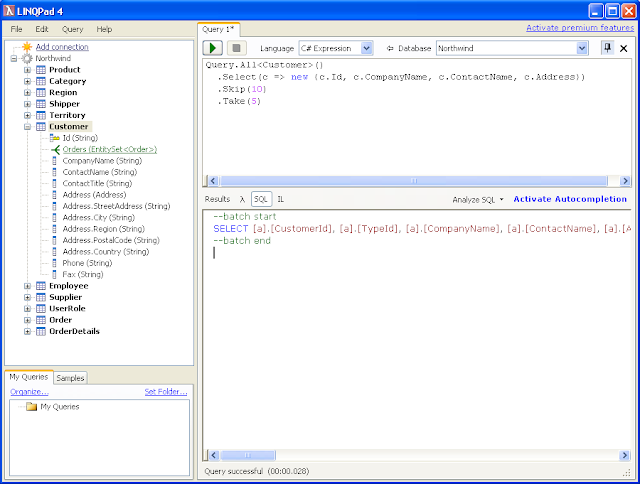 Note that you should start a query with Query.All<Entity> as you usually do in DataObjects.Net-based projects. BTW, look how structures are displayd. Beautiful! 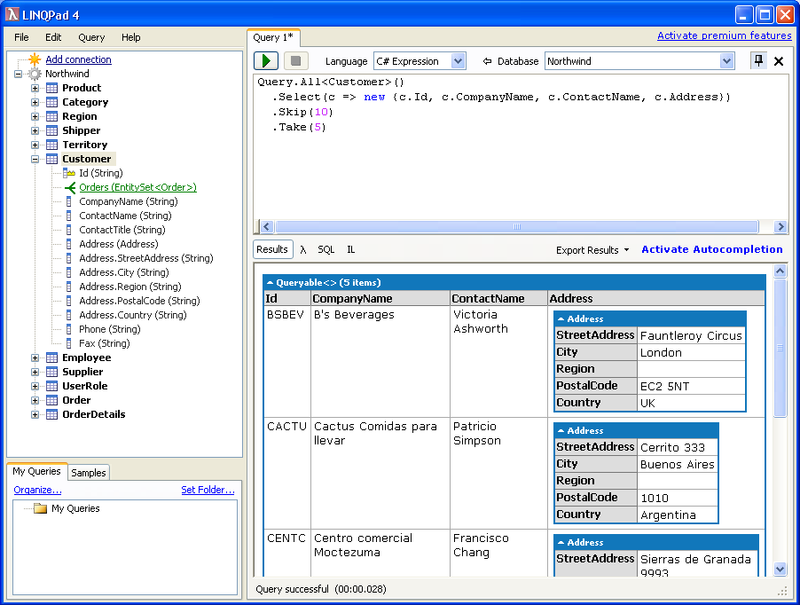 SQL tab also works. Don't know why it doesn't provide word wrapping, though =(. Alexander has received DataObjects.Net Ultimate edition as a reward and additionally promised to continue the driver support/maintenance. The driver itself will be included into DataObjects.Net 4.5 and is already available today as a part of DataObjects.Net alpha 2. Wanna get the license for free? 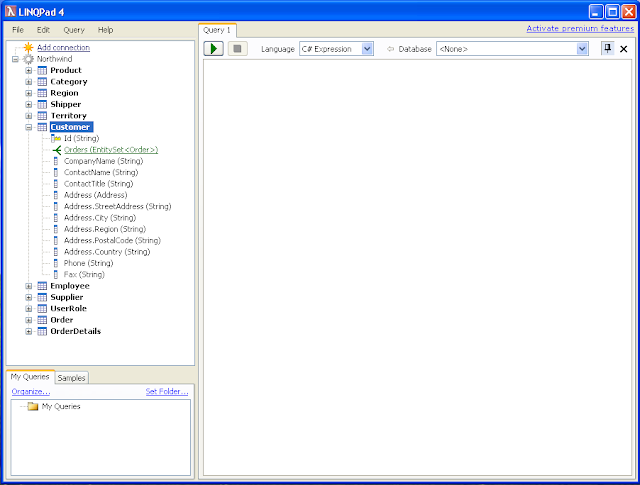 Choose a feature (or more) from the feature list and join da game! The reward is guaranteed. 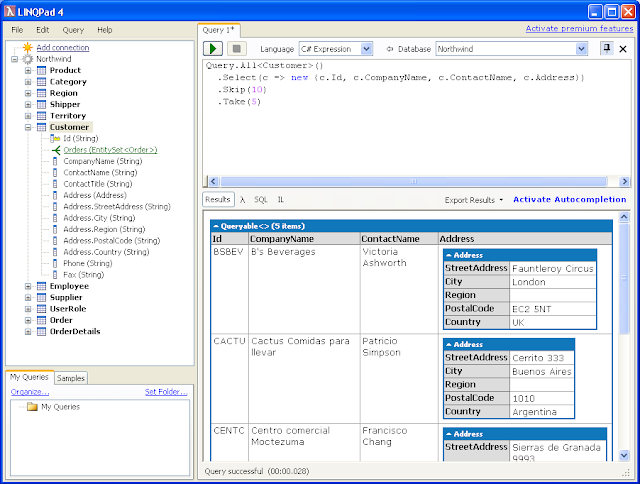 I will demo this LinqPad plugin to the Usergroup this week. Its an easy way to test queries.